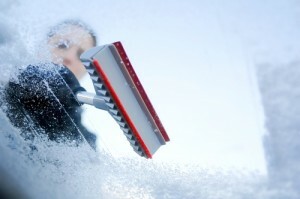 Windshield – Clear the entire windshield, not just the area directly in front of you. Back window – Without a unobstructed back window you will have to rely on your side mirrors to see and that leaves a large blind spot that is easily preventable. Roof of the car – While driving down the road it’s easy for snow to slide forward or backward and obstruct your vision, so clear off any piles of snow before you drive off. Driver & passenger mirrors – Even if you car’s mirrors are heated clean them off as you clear your car to ensure immediate visibility. Head, tail & brake lights – Clearing these not only ensure you’ll be able to see, but it will help other drivers see you. License plate – While an obstructed license plate isn’t something that will get you pulled over in every state it’s better safe than sorry and clear it off. Two of the best tools you should have to clear off your car are a good windshield wiper and a broom. You want to make sure that you can reach at least halfway across your windshield with your windshield wiper so make sure to get the correct one. Windshield wipers come in all different sizes and there even are extending ones; they’re easily found at stores with auto departments and Amazon has a great selection as well. The broom is useful for clearing thick snow off your car quickly, such as after a heavy snowfall. Making sure your windshield wipers are working and keeping windshield wiper fluid reservoir filled are also important to maintain visibility during winter driving. If your windshield wipers leave streaks or uncleaned spots on the window it’s time to replace them. A major concern during cold weather is keeping the windows clear of fog; cold outside temperatures combined with the hot air inside the vehicle and people breathing leads to windows fogging up. The defrost function on cars is specifically to combat this occurrence, but there’s a few things you can do to help the process. While it’s nice to have the heat blasting at your feet if your shoes or floor mats are wet or covered in snow the evaporation will increase moisture in the air. Another great trick that seems a little counter intuitive is to turn on the air conditioning which will help clear up the fog right away. This entry was posted in Top Driver Blog and tagged Car Safety, Emergency Kit, How To, Road Safety, Safety Tips, Tips, Winter Driving.